I have wanted to bake a strawberry cake for a long time, though I only wanted to do so if it was a from scratch recipe. There are a lot of recipes that cut a few corners by using a box cake mix and strawberry gelatin, and where’s the fun in that? I thought this recipe looked simple and trust the source (and her explanations) after baking this Red Velvet Cheesecake Cake. I decided not to use red food coloring for the cake because I wanted to test a strawberry frosting, which would be pinkish/reddish, and I didn’t want to have a pink cake and pink frosting. The cake was delicious, and everyone enjoyed it. The nice, subtle strawberry flavor evoked a familiar taste that no one could quite pinpoint, and the cake was very tender and moist. For the strawberry frosting, I wanted to use a cream cheese base. I remembered how good the chocolate cream cheese frosting was for this Chocolate, Chocolate, and More Chocolate Cake. I thought the idea of using freeze-dried strawberries to reduce the moisture of using fresh strawberries was genius. So, I traded the cocoa powder with strawberry powder. Trader Joe’s carries a number of freeze-dried fruits, so this concept could potentially work for other flavors (blueberry, raspberry, mango, pineapple, orange)! I was aiming to use a cup of the powder, but the package of freeze-dried strawberries from Trader Joe’s produced just over a half cup. In the future, I might use two bags for the frosting for a greater strawberry flavor. For the cake decorations, I started to realize that many of my cakes had either white (cream cheese) or brown (chocolate) frostings, and most were just simply frosted smoothly. The strawberry frosting certainly changed that, but I also wanted to try sprinkles, too. A sprinkle cake adds a lot of texture and is, frankly, just very fun looking. 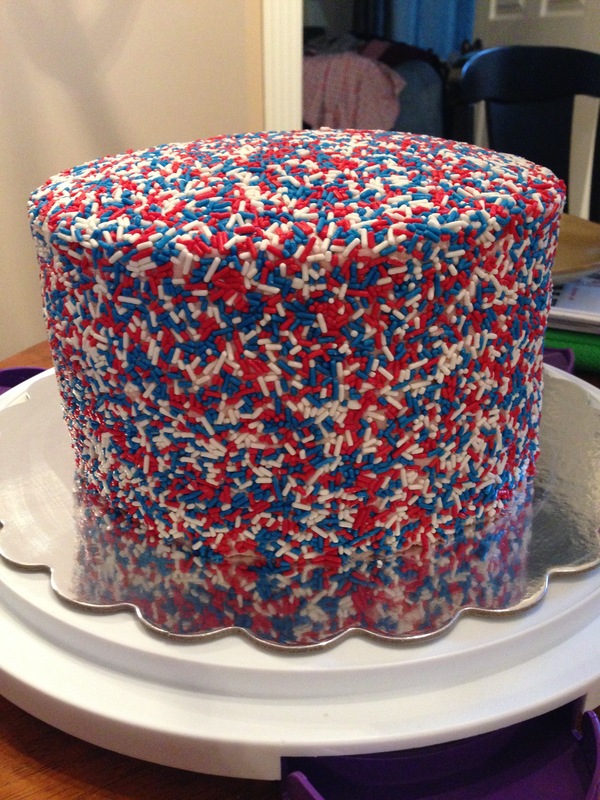 So, I got some patriotic sprinkles for the Labor Day holiday and attempted to decorate the cake with them. The best method ended up using the back of the index finger to press sprinkles into the frosting from a large spoon. Once the sprinkles covered the cake, I used a small piece of wax paper to press them more firmly into the frosting. This was a nice change-up to the usual chocolate/vanilla cakes and will definitely be added to the rotation. Even my wife, who typically prefers the more traditional dessert offerings, was pleasantly surprised by it, despite expressing her concerns about my decision to bake a strawberry cake. Hull strawberries, then use a blender to puree. Use a fine mesh strainer to remove seeds and measure one cup. Set aside. In a stand mixer, blend sugar, oil, and eggs for one minute on medium speed. In a large bowl, whisk together flour, salt, baking powder, and baking soda, then slowly add to the stand mixer slowly over low speed. Gradually add in the buttermilk over low speed. Add the vanilla and strawberry extracts, followed by the strawberry puree. Divide the batter between the two cake pans (I had about 559 g in each pan). Bake for 25-30 minutes or until cake tester comes out clean. Let cakes cool in pans until cool to the touch, then carefully invert onto a wire rack lined with plastic wrap. Cool cakes in the refrigerator or freeze to firm before frosting. For the frosting: Blend freeze-dried strawberries to create a strawberry powder. Set aside. Using a stand mixer, mix cream cheese and butter on medium-high speed until smooth. Mix in strawberry powder, then frost the cakes as desired.